Turkey's a highly popular place. 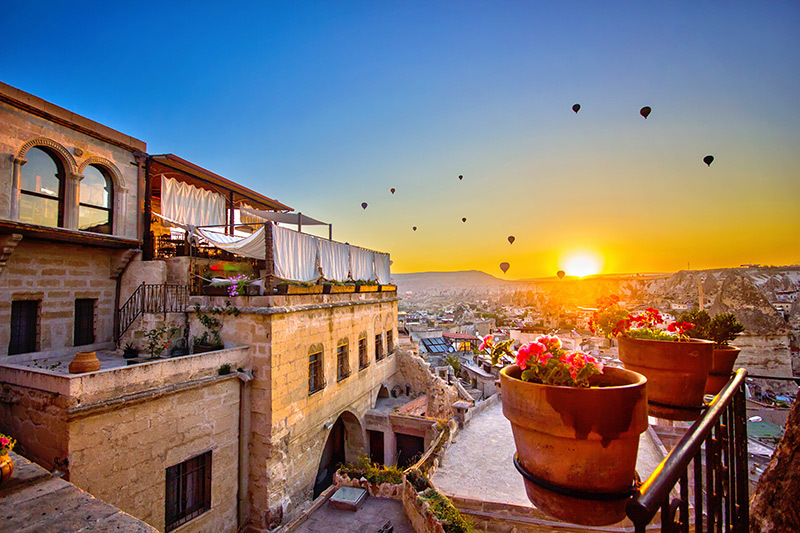 Many people enjoy all the attractions it has to offer including the Aya Sofya, a Byzantine building in Istanbul and the ancient Greco-Roman ruin Pergamum, once home to one of the world’s most important libraries. 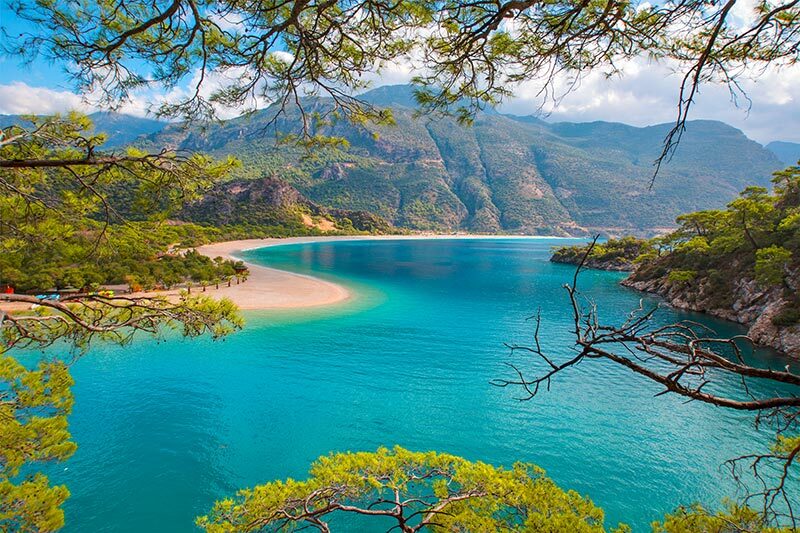 But there’s a lot that makes Turkey an appealing holiday destination. 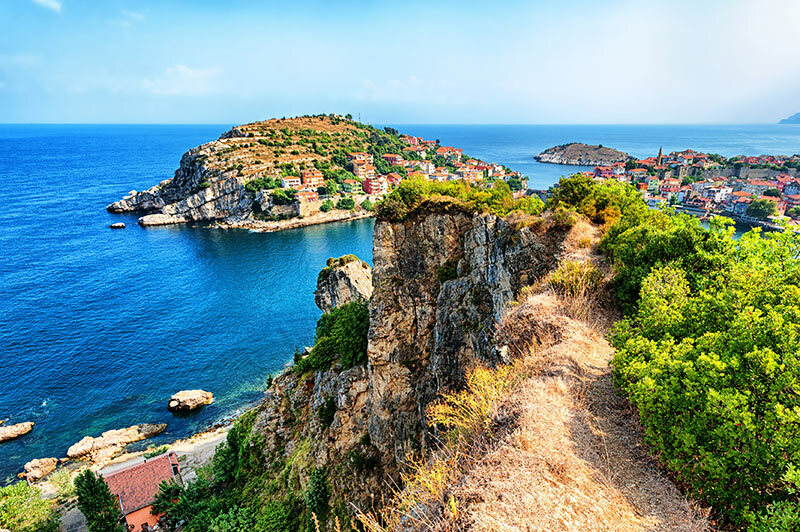 Its Mediterranean climate, beautiful beaches, mountains perfect for hiking and the friendly locals. The GOV.UK website advises staying at least 10km away from the Syrian border and other regions close by (click here to see a summary). Since most tourist destinations are in the Aegean region you're very unlikely to be anywhere near dangerous areas. For example Daylan, a popular tourist spot is more than 700 miles from Syria (further than the entire length of Spain). It’s always best to be vigilant on any holiday. 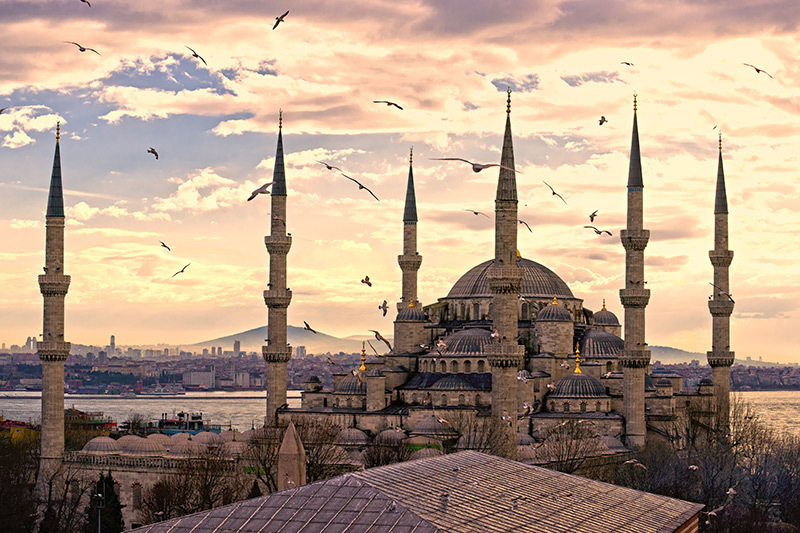 If you go to a busy city in Turkey, as with any other city worldwide be vigilant and if you see suspicious behaviour it’s best to alert the authorities. Yes, you do. It’s easy to obtain a visa to visit Turkey, as long as you use the official routes, like the Republic of Turkey’s e-visa site. Other sites, may be a scam or ask for an additional fee and it could end up costing you more in the long run. Turkish cuisine is largely based on the Ottoman style. Over the years it has been heavily influenced by European styles of cooking. You can expect to find many different dishes like menemen; a traditional Turkish breakfast with scrambled eggs and sautéed vegetables, served hot with a slice of bread, or the famous kofte; Turkish meatballs of ground beef or lamb and served in a variety of different ways. 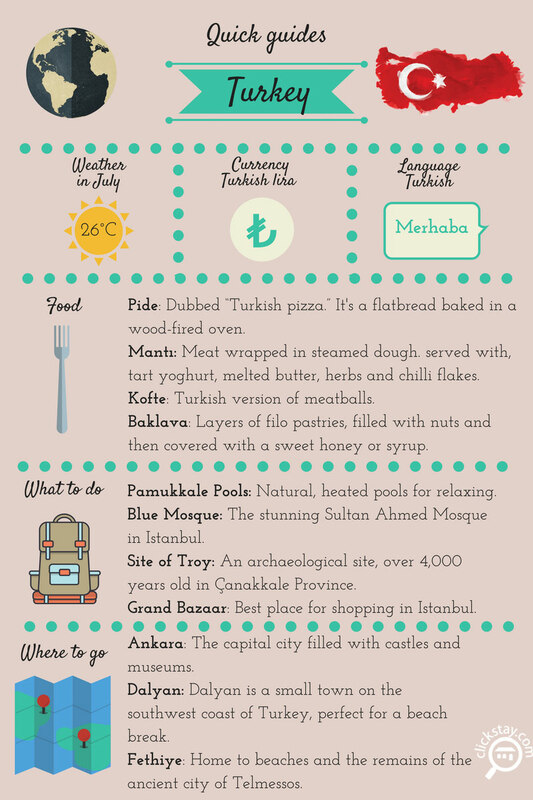 The style of food is different throughout the country, with Istanbul, Bursa and other popular tourist destinations favouring a lighter use of spices, a preference of rice over bulgur, koftes and wider availability of vegetables. plus, if you're a fan of a kebab then Turkey is the place for you, as they are very common and served with rice or chips. If you'd prefer more western appetites never fear, Turkey is home to many fast food chains like McDonald's and you can expect some British cuisine like fish and chips. You are unlikely to become sick from eating Turkish food, unlike Thailand and India Turkey don’t use massive amounts of spice so it’s unlikely to give you a poorly stomach. Children are important to the Turkish, and they are welcomed everywhere. The local people are very accommodating to all needs of a young family. Formula milk and nappies are readily available in stores and UHT milk is easily accessible in cartons. In restaurants, it is perfectly normal for children to go out for a meal with their parents and most food establishments provide high chairs and are willing to accommodate any of your family’s needs. Plus, there are many attractions to keep your children entertained for hours including water parks and aquariums. Like any country, the temperature in Turkey is changeable depending on the time of year. If you wanted to stay during the height of summer (July) you can expect temperature highs of around 26°C and may rise to 31°C. However, if you wanted to go to Turkey for some winter sun the average temperature is 12°C in December and may rise to 16°C. I can’t speak Turkish; how will I get by? Most people in popular areas of Turkey speak English. But if you wanted to venture to the more rural parts you’ll start to struggle. It’s uncommon in small villages outside of tourist hotspots to speak English. However, if you’re staying in a resort and you plan on going out for a meal you will have no trouble as the staff are very likely to be fluent English speakers. Is sunbathing in a bikini acceptable in Turkey? The Mediterranean climate makes Turkey the perfect place for a spot of sunbathing and topping up the tan. If you’re staying in tourist destinations then feel free to wear whatever makes you comfortable. However, if you’re planning to explore local areas, and you’d like to visit a mosque, then you should lightly cover your head, arms and bare legs as a sign of respect.